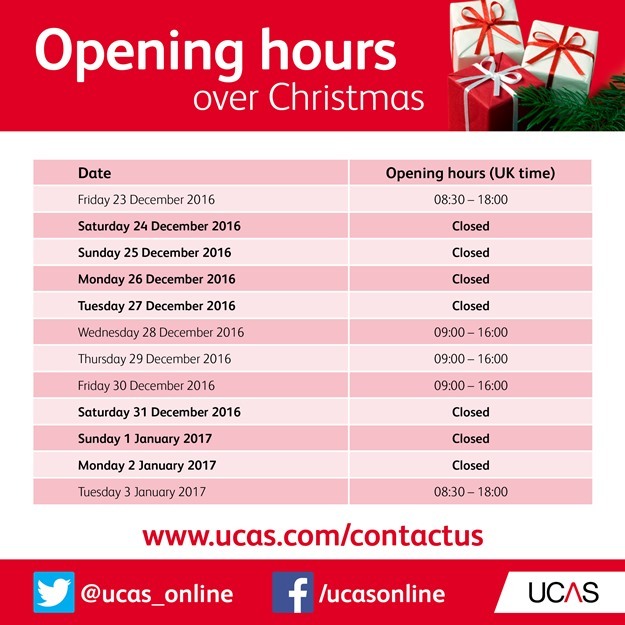 We’ll be taking a little time off over the holidays, so please familiarise yourself with our opening times below, and if you have any questions, contact us before we close. Share these times with your son or daughter too, so they know when we’ll be here for them if they need us. Drafts and redrafts their personal statement, to make sure they don’t miss out on their opportunity to showcase why they’re the right person for their chosen courses. We have a handy personal statement tool which will help them think about what to include in their personal statement and how to structure it. Sends their application to us before the relevant deadline to ensure it is given equal consideration by their chosen universities or colleges. Applications can still be sent to us after our deadlines, but the universities and colleges cannot guarantee they’ll be considered or even looked at. You can find out more about when to apply on our website. Checks whether their school has set an earlier deadline for when applications need to be completed. All applications need a reference before they can be submitted to us. What happens once their application has been submitted? Once their application is submitted, your son or daughter can keep an eye on Track to check its progress. Here they’ll be able to see decisions from their chosen universities and colleges, and reply to any offers they’re made. There are a number of different decisions universities and colleges can make, and different replies your son or daughter can make to any offers they receive. It can get confusing if they’re not prepared, so encourage them to take a look at our website to understand types of offers.